As men discern their futures and look at the possibility of embracing the missionary life several seek out opportunities to get their feet wet and experience the life firsthand prior to making any decisions. Fr. Shaun Crumb, now serving in China, first went there as a Maryknoll volunteer and taught English in a Chinese university for one year. Later he entered the seminary. In the photo above, as a seminarian, Peter Latouf traveled with a team to North Korea to provide medical aid to tuberculosis victims. Now a priest Fr. Peter is serving in Hong Kong. During the summer of 2016 Paul Shultz went to Tanzania. He has just been accepted to begin training as a Maryknoll Brother. The message of God’s love for all people is so important. It needs to be preached not only in words but in the actions of our daily lives. Each of us is a messenger wherever we go and in whatever we do. But, we still need to take some steps in the direction that will fulfill the dreams of the missionary life. 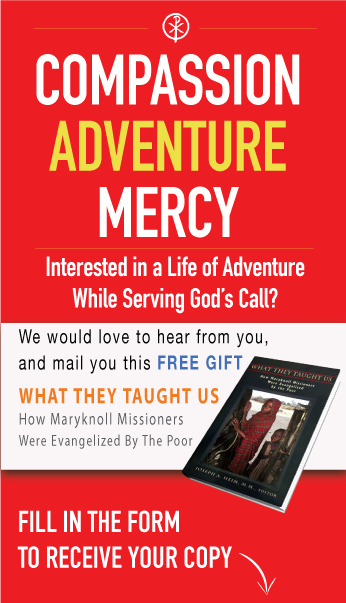 If you are thinking o becoming a priest or Brother with Maryknoll consider a short term commitment to mission as a step along the way. It will change your life!